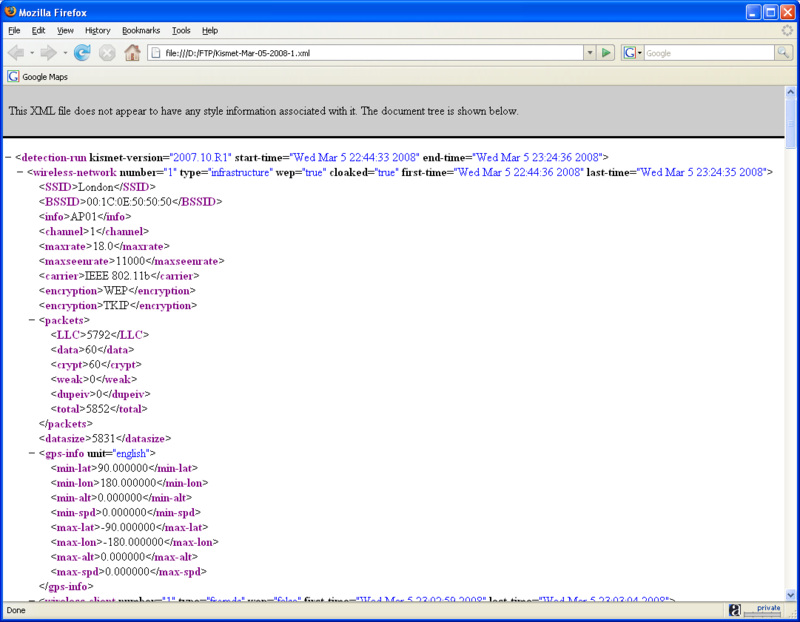 Kismet generates several types of logs such as "dump", "csv" or "xml" files. Log setting is done in the kismet configuration file "kismet.conf", located in the /var/log/kismet directory (package installation). # "netlogs/Pok-Dec-20-01-2.%l" for the second logfile generated. There is no ".gps" file because we have no GPS system. The file provides information about CDP (Cisco Discovery Protocol) broadcasts. CDP is a proprietary layer 2 network protocol developed by Cisco Systems and runs only on Cisco and some HP equipment devices. In our case study, this file is blank because there are no Cisco Access Points. CSV (Comma Separated Values) files are specially formatted plain text files where data is separated by characters such as semi-colons or commas. To read optimally this kind of file, use OpenOffice Calc or Microsoft Excel. 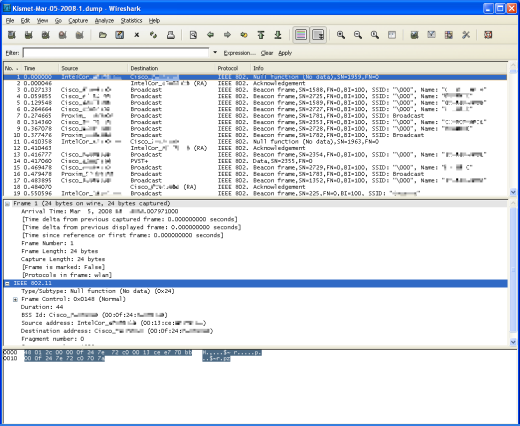 A raw packet dump file readable by tools such as Wireshark, Tshark or TCPdump. You can use the "V" (verbose) Tshark option to display full details about each frame. Network 1: "London" BSSID: "00:1C:0E:50:50:50"
Encryption : "WEP TKIP "
First : "Wed Mar 5 22:44:36 2008"
Last : "Wed Mar 5 23:24:35 2008"
Network 2: "<no ssid>" BSSID: "00:14:F2:90:90:90"
Network 3: "<no ssid>" BSSID: "00:20:A6:07:07:07"
Encryption : "WEP TKIP WPA AES-CCM "
The number of packets with "weak initialization vectors" (IV). An irregularity in the RC4 encryption algorithm enabled certain IVs, called weak IVs, to reveal information about the WEP key. 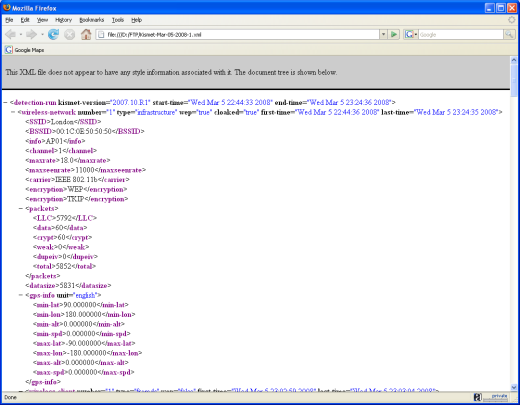 XML (Extensible Markup Language) is a sort of advanced HTML language where you can choose an unlimited amount of markups. Every piece of data is defined by a markup to easily and precisely identify it by a people or a program.